When I first launched this website, I called it The Good Life Denver because life in Denver really is The Good Life! You have to try hard not to love Denver, and when you have guests in town you appreciate even more just how Good it really is. We then went to lunch at El Paraiso, an awesome Mexican restaurant I reviewed several years ago here. Though the restaurant has updated the look of its menu, the food is still the same and still delicious. If you haven’t been there before, go!! 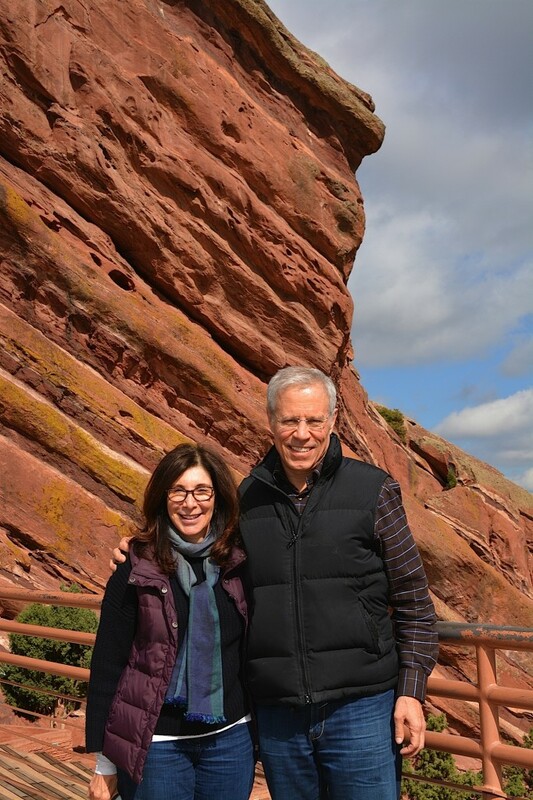 In spite of being to Colorado over a dozen times in their lifetimes, my parents had never been to Red Rocks. They were long overdue. I love how when there are no shows going on you can walk right in to take in the views, get a workout in on the stairs, or even get on stage and feel what it’s like to be a rock star at one of the most beautiful music venues on Earth. No big deal! When I was growing up, my family used to come out to Colorado every summer for a week at Lost Valley Ranch, a four-star dude ranch in Sedalia, CO. In 2002, Lost Valley was in the direct pathway of the largest forest fire in Colorado history–the Hayman Fire. Miraculously, and I mean miraculously, just as the fire approached Lost Valley, it split into two parts and forked around the ranch, then came back together after passing it. The ranch survived, and my wife Jessa and I went there a couple years ago for the first time since–it was fantastic. I brought my parents back for their first time in about 14 years, and they were thrilled to see it again. Though there is extensive fire damage in the area surrounding the ranch, the ranch itself was spared, and their signature brand of western hospitality is unparalleled in the industry. Definitely a fantastic place for a visit. We returned back to Denver and grabbed a big dinner with my parents, Jessa, and her family at the new Humboldt: Farm Fish Wine restaurant on 17th Ave. 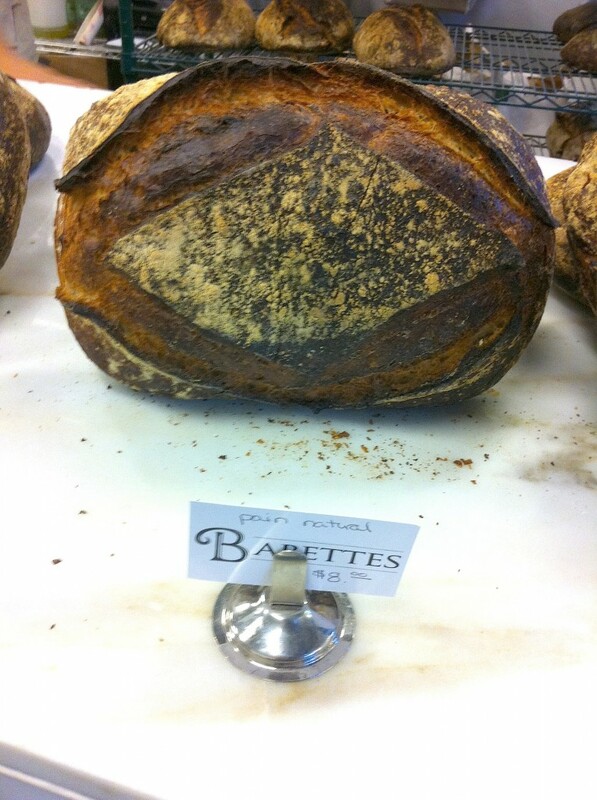 The food was delicious, the space was well-designed, and the atmosphere was lively. I encourage you to give it a shot. We then went to Little Man, which holds a special place in my and my wife’s hearts, as it’s where we had our first date. Luckily it was a cold night, the line was unusually short, and we were able to enjoy our salted Oreo ice cream in no time at all. On Saturday, we got brunch at City O’ City–which never disappoints. The seitan buffalo wings are to die for, and I love the saison sandwich and the power waffle. The chilaquiles are also quite Good. 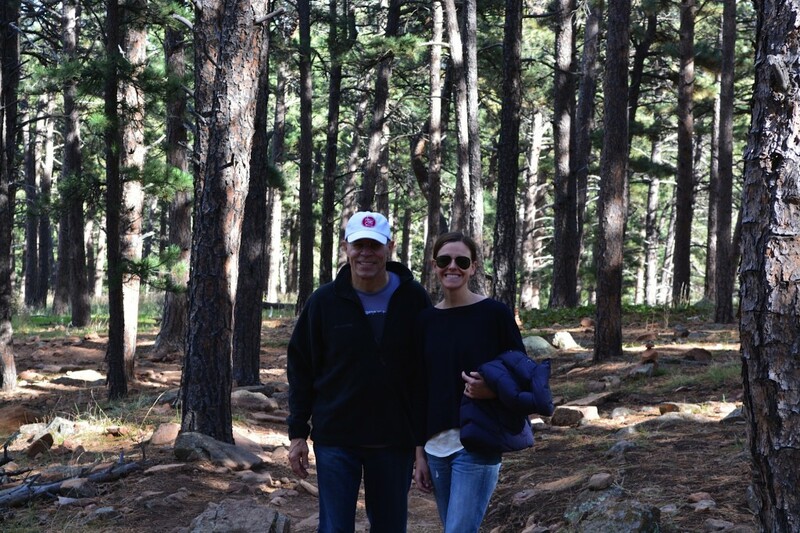 We then headed to Boulder, where we went on a short hike in Chautauqua Park, which was followed by shopping on Pearl St. Peppercorn continues to stand out as one of our favorite shops on the mall–they have the best kitchen gadgets, sauces, cookbooks, and treats. On Saturday night we were planning on cooking dinner at home, but we made a last-minute decision to go see Captain Phillips at Denver Pavilions. We snuck in some Illegal Pete’s burritos, and enjoyed what we all ageed was an intense and excellent movie. On Sunday we started our day at Zaidy’s, one of my favorite brunch restaurants in town. A Jewish deli that has a little something for everybody, the restaurant’s menu is full of delicious items like the latke reuben, which I couldn’t resist. 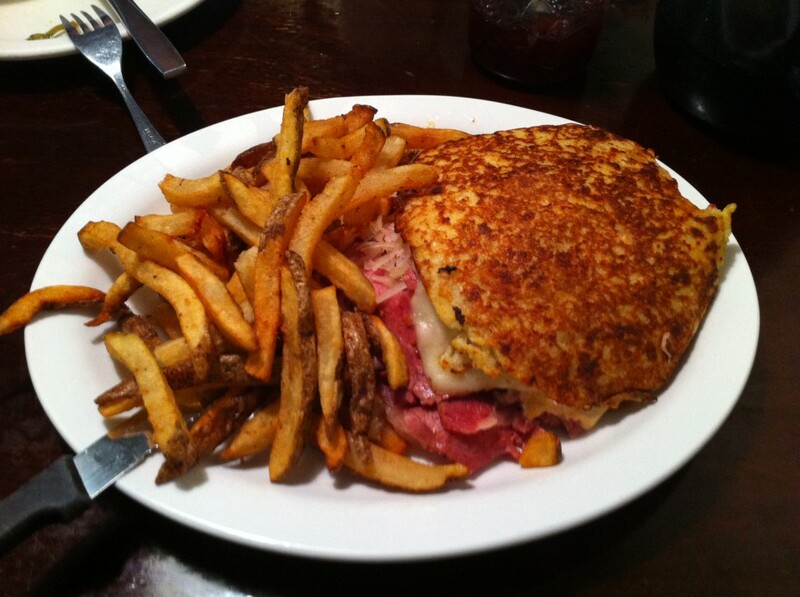 Savory corned beef, sauerkraut, and thousand island dressing come served not on rye, but between two huge latkes (potato pancakes). The dish is exceptional… and exceptionally filling. 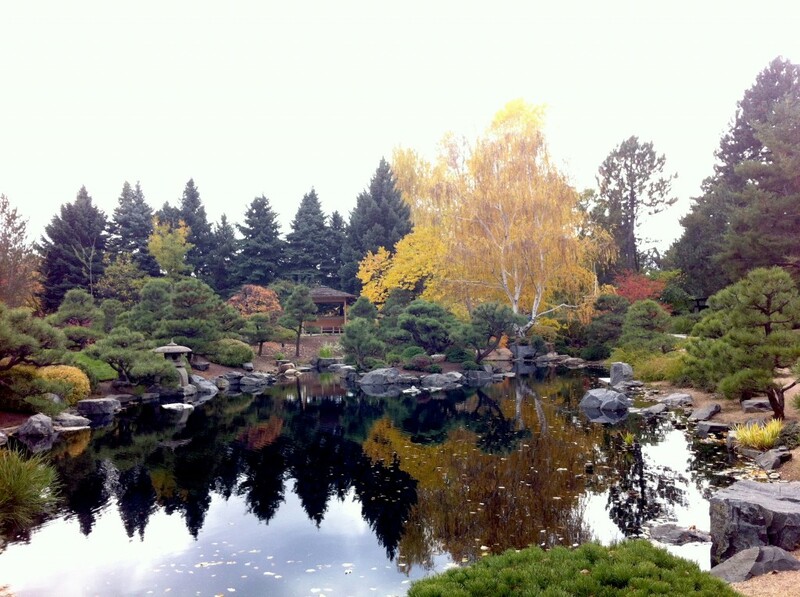 We then went to the Denver Botanic Gardens, which I had never been to in the fall season. The DBC is beautiful in the spring and summer, but fall just might be my new favorite season there. The Sugar Maple trees were a breath-taking and bold reddish-orange color. Amazing. We then took a walk in Wash. Park, which, of course, is also very pretty in the fall. My parents were slated to leave on Monday in the early afternoon, but I felt that no trip to Denver would be complete without a brunch at Snooze. My strategy at Snooze is to order a flight of pancakes to split, then follow it up with individual savory menu items. That’s what we did, and the pancakes were, as always, extraordinarily Good. I love the breakfast pot pie, and it, along with some chicken sausage on the side, truly hit the spot. Though it was sad to see my parents go, their visit here was wonderful, and it reminded me (and them) just how Good life in Denver really is.